You are here: Home / Ethnic Groups / The People of Sumatra / Who are the Singkil? The Singkil people live in the South Aceh Regency which is in the southwestern part of Aceh Province. The Singkil area borders on North Sumatra Province. The Singkil people are a mixture of the Mandailing, Aceh, Minangkabau, and Nias peoples. The Singkil language is called Pesisir Singkil. It is influenced by the Minangkabau and Batak languages. Two different groups call themselves the Singkil: the Ulu people and the Ba’Apo. The two groups live side by side, the Ba’Apo in the center, and the Kade-Kade on the outskirts. The Singkil’s main source of income is farming and fishing. Some work as day laborers and craftsmen. Others process nipa palm leaves and fruit that grow along the rivers and in the swamps. Nipa leaves are used to make roof thatch and cigarette wrapping, and the fruit can be eaten. 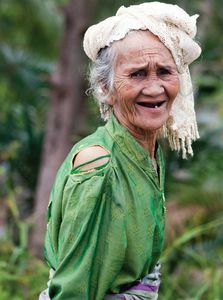 The Singkil live in villages on the coast, along the rivers, and in the hills. The Singkil River is important in local daily life. Singkil houses are built on wooden stilts about three meters off the ground. Togetherness and strong family ties are important in the Singkil people’s way of life. Their life is regulated by traditional culture and Islamic laws. Cultural and religious leaders are very influential and respected in the community. The main traditional political institution in the community is called ninik-mamak. This institution functions not only in cultural affairs but also in solving village government problems. Ninik-mamak consists of older people and those chosen as elders, such as the kepala mukim (district head), pemuka adat (cultural leader), and khatib (preacher). The Singkil have a patrilineal kinship system, meaning that they trace descent from the father. The smallest kinship group is the nuclear family. The extended family is called dulsanak. They also have clans, which are made up of several extended families. One must marry outside one’s own clan. In recent years there have been two natural disasters: a tsunami and an earthquake. During the 2004 tsunami that destroyed the west coast beach of Aceh, the Singkil were spared by the great wall of water, however the earthquake that caused the tsunami did much damage. The tsunami wave also caused much fear in the community. The Nias Island earthquake also caused significant damage to Singkil town. The elevation of the land sank as much as one meter in places and many houses were destroyed, but no lives were lost. Because of the earthquake, many locals moved to higher areas. The Singkil people follow Islam, although some of them still trust in the spirits of their ancestors and religious leaders that have died. One place that is considered sacred is the grave of Abdul Rauf, a great religious teacher. The Singkil people also regularly seek the services of a shaman. The Singkil people are looking for economic advancement as they try to find ways to earn more income. Many do not understand the complexities of their economic situation. For most Singkil, improvement of agriculture and fishing enterprises would also be very beneficial. Clean water is also needed, as it is quite difficult for most Singkil to obtain, especially for those living in swampy or sea areas.